Members of the Rebel Alliance decide to steal the building plans of the Death Star after finding out there may be a design flaw that could destroy the weapon. Intel is questioned when the source is known to be an Empire scientist who helped build the weapon. All right. I’m just going to come out and say it. This one wasn’t on the top of my list of movies to watch in the theater. Don’t get me wrong. I respect the Star Wars franchise. I may not love it as much as others who are die-hards in this fandom (like, from the beginning beginning and not just in this past decade), but I do enjoy the movies. It just isn’t on the top of my list because there are other movies I wish to see on the big screen and this one I am good with waiting for the DVD or Netflix to pick it up. That said, I am so glad I did watch it on the big screen because this is my favorite one yet. I have to say that I appreciate this story line in the franchise. It’s the event that set things in motion. Though I don’t think that’s entirely accurate when you consider that it really has nothing to do with the conversion of Darth Vader and such. That part of this universe was in motion before this so allow me to rephrase. This event turned the tide for the Rebel Alliance and fills the gap between Episodes 1, 2, and 3 to Episodes 4, 5, 6. Anakin is already in Darth Vader mode, but Luke and Leia haven’t really entered the picture yet (for those of us who need to get our bearings in this world because we aren’t die-hard Star Wars fans. And please feel free to correct me if I’m not quite getting it either). 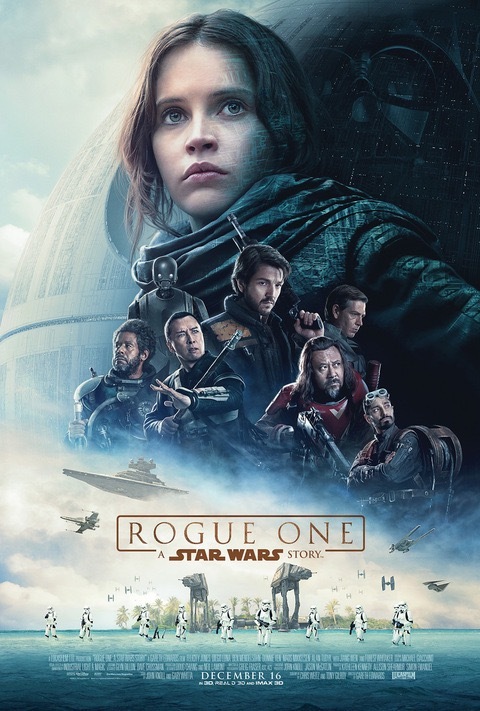 Rogue One revolves around the Rebel Alliance stealing the plans from the Empire so that Luke can blast at the Death Stars vulnerability and–ka-boom!–that is the climax of Episode 4: Star Wars. This story gap is brilliant. Who doesn’t love a good underdog-in-your-face kind of story? I mean, we all can guess what happens, but it still makes for an exciting adventure albeit a tragic one. I feel Garth Edwards is genius in his execution. He added his mark on this franchise and deserves all the accolades tossed his way. Weitz and Gilroy did a great job translating this story into a script Edwards brought to life. The story moved along at a steady pace and I felt the character introductions were done nicely and the plot points were well placed. Intense scenes were balanced with humor and I couldn’t help but admire the way things came together. This coming from my mind where I kind of knew what the ending would be and yet couldn’t help but watch, cheer, and get all pumped when our team accomplished its mission. Of course, picture and story mean nothing without a cast who can carry the storyline to completion. Felicity Jones (Jyn Erso) did such a good job in this leading role. I haven’t seen her before this film so I can’t compare with past performances, but I can’t wait to see her in Inferno (which is on my list of theater-going movies because I am a huge fan of Robert Langdon, of the books–not that Tom Hanks isn’t doing a good job portraying this beloved fictional character of mine. I digress). Diego Luna (Cassian Andor) also does a good job acting Jones’ opposite. This duo did a good job leading this story and their chemistry blended well with Donnie Yen (Chirrut), Wen Jiang (Baze), and Alan Tudyk (the voice of K-2SO. And he did a great job for a robot voice. Great job meaning he brought personality to this robot voice and the comedic timing and tone on his lines were on point. So there.). Appearances by Forrest Whitaker (Saw Guerrera) and Mads Mikkelson (Galen Erso) added just the right touch to move the story along and give us fans more characters to . . . appreciate. It is definitely worth the investment to add this to your library and I know that goes without saying (and not even a question) for this fandom. As I mentioned earlier, this one has to be my favorite one in this saga. It may be because I find this one the different from the rest. Unique. A divergence of the original story line (sort of). But that would be irrelevant if it weren’t for the way it was brought together so kiddos to Gareth Edwards and his production team for giving us another one to add to our library.